Use templates for projects you repeat over and over, so you don't need to start from scratch each time! Check out a 📹 video to learn more about templates! Create and view templates by clicking the link just below your "New Project"" button. Templates are for full projects only. Check out Email-in or Copying for some tips on reusing to-do lists! Add some people: Click the "Who will be invited?" 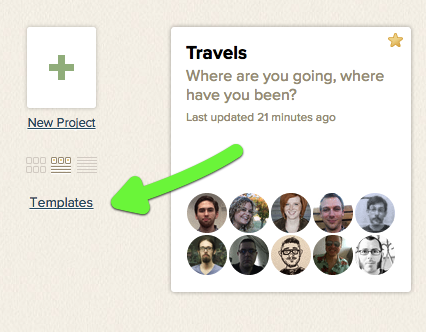 link to add people to your template. These people will automatically be added to the project when it starts. These are the only people who can view and edit the template and create projects from it. 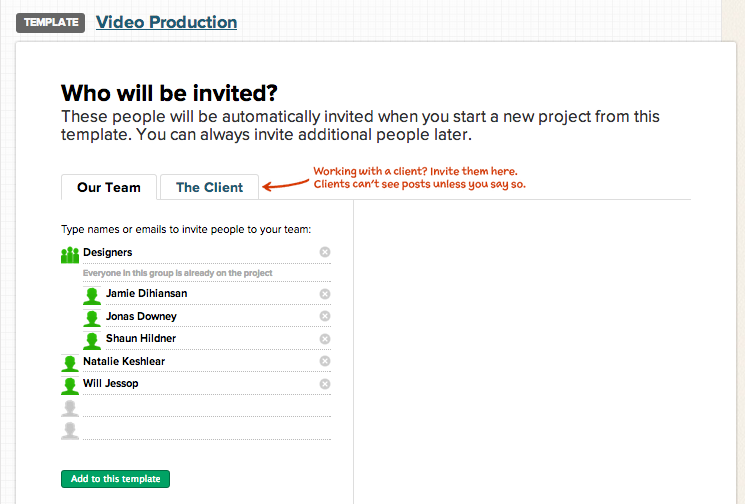 You can set up client projects in your templates too! These invitations aren't set in stone. You can remove users during the draft phase. 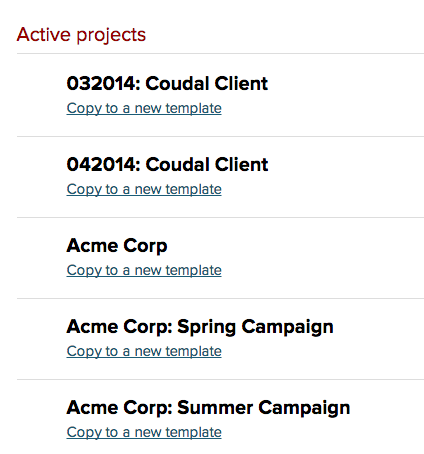 Add some stuff: Templates can contain almost everything an active project supports. This means you can add discussions, comments, files, and to-do lists with assignments and due dates. Templates do not have Email-In addresses, though, so you won't be able to forward emails. Files in your templates will count against your account limit. From the Templates page, click "Make a template from an existing project..."
Choose a project from the list of active or archived projects. Create your template and the link will appear when it's ready to go! Changes you make to your original project after the template has been created will not appear in the template. 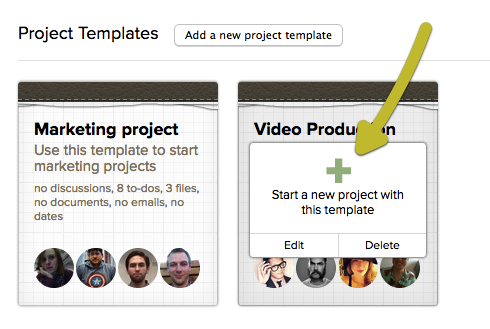 Click Templates: Select your template and click "Start a new project." Make changes: Before you start your project, you'll be able to make updates and changes. This is called the draft. When you're ready, click Publish. Your project will go live! Templates don't count against your project limit, but drafts do. Only the person who created the draft will be able to access it. The dates you add are relative to the start date of the project. You'll be able to pinpoint which week and day of the week they occur. 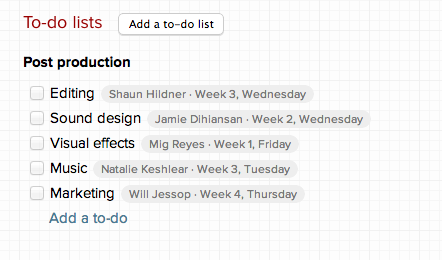 The day you start your project is considered part of "Week 1." Week 1 starts on the prior Sunday. Your dates will be plotted relative to that day, and you can preview this in the Project Draft. You can make any date changes you need before the project goes live. You can add recurring events too! When you start your project, the members will get one summary notification email. This email will contain all their assignments, messages, and other project info. Once the project is live, your notifications will resume as normal.